In some cases, it is what happens before the patient arrives to the sleep lab that determines how easily they may be able to sleep. Education by the referring provider, or a set of clear instructions sent out ahead of time, may be helpful. There are a few considerations that should be prioritized. The ability to fall asleep is highly dependent on two factors: the homeostatic sleep drive and the circadian alerting signal. The sleep drive can be enhanced by observing an earlier wake time, avoiding daytime naps and going to bed feeling sleepy. The circadian alerting signal may dictate when a patient should schedule a sleep study. Accommodations should be made for people who have delayed sleep phase syndrome, or for shift workers, so that the timing of the test corresponds to their typical sleep patterns. In many cases, this will require daytime staffing and efforts to preserve a quiet and dark sleep environment. Caffeine consumption should be discouraged the day of the testing. Alcohol use should reflect typical usage patterns, and moderation may be encouraged. Normal activity levels, including exercise, should be maintained. 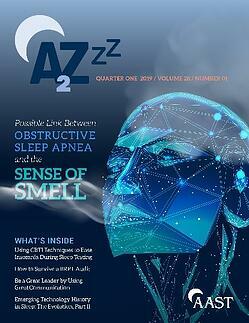 In the rest of this article from the Q1 2019 issue of A2Zzz, Brandon R. Peters, MD, talks about establishing a sleep sanctuary and using relaxation techniques. To earn AAST CECs, carefully read the four designated CEC articles and claim your credits online. You must go online to claim your credits by the deadline of May 20, 2019.